In discussing the new Jewish Nation-State Law, Third Narrative participants have generally expressed strong sympathy for 180 prominent Israeli artists, writers and intellectuals who have signed a letter calling for the cancellation of the recently passed basic law. 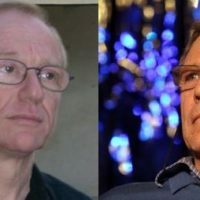 (Novelists David Grossman and Amos Oz, pictured above, are among them.) In a substantive sense, the law may not be taking away rights from its non-Jewish citizens, but this largely symbolic measure (this TTN post includes the law’s text) is deliberately provocative in failing to reiterate Israel’s commitment to democracy and equal citizenship, values enshrined in Israel’s Declaration of Independence. The impact of this law is to insult Israel’s non-Jewish citizens, officially telling them that the state is not really theirs. Following what was going on in Israel since the Knesset voted the above law has been an emotional rollercoaster. By purposely excluding the word “EQUAL” from the Nation-State Law the ruling coalition weaponized it to be used in fighting against the opposition in the forthcoming elections campaign. However, the majority coalition members were blind to the collateral much greater pain they inflicted on the Israeli ethnic minorities. You cannot judge the Nation-State law by the reactions within the Jewish population. It is the situation of the minorities which counts. And the reaction of the Druze community in particular, but that of the [Palestinian-Israeli] Arabs and Bedouins too, has been one of deep emotional feeling of being rejected and/or relegated to second class citizens. To encapsulate these reactions there were three particular ones played on Israeli TV. Tablet’s Liel Leibovitz, in his usual role as a caustic defender of Israeli actions that should not be defended, correctly points out that Israel’s been the “Jewish state” from its inception. Which is why it’s totally unnecessary (which Leibovitz does NOT address); it’s a naked political gambit for Netanyahu and Bennett to pander to their supporters. But as the loud protests from the Druze indicate (including Members of Knesset in the government coalition demanding that the High Court strike it down), denigrating Arabic (even though written ambiguously) was seen as especially galling. A Jewish state law that doesn’t reassure all minorities that they too are valued and protected as citizens — at least as an aspirational ideal — is just asking for trouble. In practice, Israeli Arab communities are underfunded and Arab citizens are discriminated against in housing. And the ongoing removals of “unrecognized” Bedouin villages in the Negev has alienated a traditionally loyal population that often volunteered for the IDF. Druze protests have even shaken Naftali Bennett, head of the Jewish Home party and a prime-mover for the law; he’s publicly stated that this law harms “our Druze brothers.” It is reported that “Bennett would likely ask for an amendment to the law when the Knesset returns from its recess in October that would protect the rights of the Druze, who serve in the IDF.” But if an amended law includes Druze as a favored minority, this would be a further slap to those citizens of Israel who are not recognized. Shulamit S. Magnus, a Jewish history scholar who made aliyah from the US four years ago, published this eloquent protest at the Jerusalem Post: “THE NATION-STATE LAW’S GIFT TO THE NINTH OF AV.” It includes this poignant sentence: “It was excruciating to hear the protest of Druze, Bedouin, and Muslim officers serving in Israel’s Foreign Service about being marginalized and alienated by this gratuitous, insulting, law.” She also cites the sacrifices of Druze and Bedouin serving in the IDF; and she further mentions that well-known politicians brought up in the Revisionist (rightwing) Zionist tradition — such as Pres. Reuven Rivlin, Likud MK Benny Begin (yes, Menachem Begin’s son) and former Likudnik Tzipi Livni — oppose this measure. Kahanists Have No Place in Knesset! All I can say at this time is Israel, as well as America, have enemies WITHIN: TREASONOUS GOVERNMENT EMPLOYEES – JEWS, ISRAELIS AND MUSLIMS! Yes! Muslims employed in the Knesset use their positions to incite Muslims (and treasonous Jews/Israelis) to riot demanding more power! Yes . . . ENEMIES WITHIN: TREASONOUS GOVERNMENT EMPLOYEES!!! DON’T ANYBODY TELL ME ISRAEL IS UNFAIR IN ITS ENACTMENT OF THE “BASIC LAW: ISRAEL AS THE NATIONAL-STATE OF THE JEWISH PEOPLE”! Let’s pray Israel won’t allow it to be changed!! !